Located near the scenic South Saskatchewan River, in beautiful Saskatoon, SK, Prairieland Park has the city’s largest Trade and Convention Centre. Just minutes from downtown, with thousands of free parking spaces and 240,000 square feet of highly transformational space, it is the type of venue where great things happen! The WORLD TRADE CENTER Saskatoon at Prairieland Park consists of six halls, connected by a gorgeous common foyer, with seven digital screens directing guests through the facility. The versatility of the facility creates an optimum environment for both large and small events. With technical production services, food and beverage department, equipment and electrical services all in house – we provide everything needed for a successful event. Beyond the Trade and Convention building, Prairieland Park is able to host outdoor events such as live concerts, rodeos, Chuckwagon races, fairs and festivals, outdoor weddings or vehicle/driver training. Between the Grandstand, the Kickin’ Horse Saloon, the 20,000 sq ft saddle span tent, Marquis Downs Horse Race Track, our fair grounds and the huge free parking lot, we can accommodate and create many events others in the city simply cannot. We take great pride in our commitment to providing unparalleled service of the highest standards, excellent food and great value. Our team of Event Coordinators have a reputation for impeccable, detail-oriented customer care ensuring your event runs smoothly. Prairieland Park’s Food and Beverage Department is known for its creativity, quality and service excellence. Our state of the art kitchen allows us to provide the best in fine food and beverage through a wide range of services offered. When planning an event every detail is essential and important to ensure that the day runs smoothly. Music, beautiful ambient lighting, slideshows, video presentations, microphones and everything in between are things that Prairieland Park is proud to offer as an in-house service. Let our years of experience guide you and help you every step of the way. 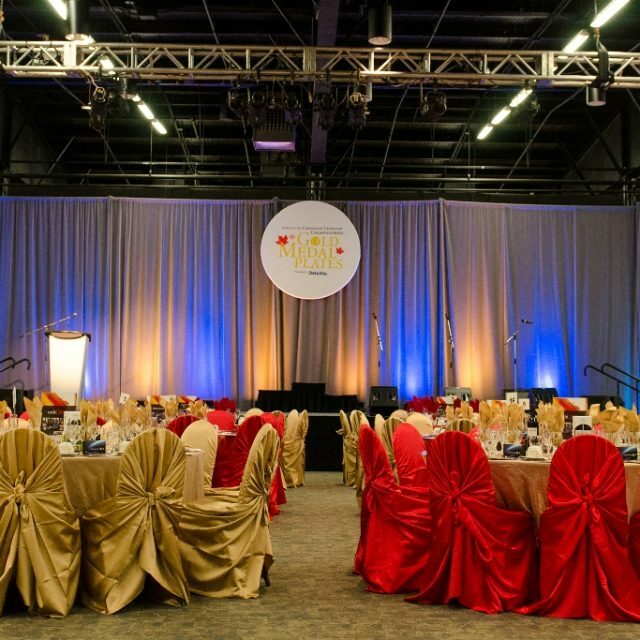 Saskatoon Prairieland Park continues to facilitate local, regional, national and international trade shows, conventions, conferences, meetings and banquets.